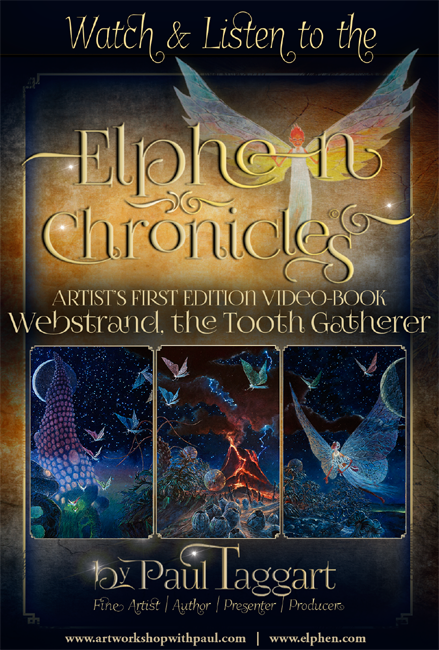 Welcome to Paul Taggart's 'Current Projects' Gallery which is all about 'Paul Taggart's Elphen Chronicles' - covering both Book 1 and the current project, Book 2 'Webstrand, the Tooth Gatherer' - including Paul Taggart's, Artist's First Edition Video-Book 'Webstrand, the Tooth Gatherer'. CLICK HERE FOR THE LATEST NEWS on the News & Events page here on Paul Taggart's official website. There are 20 works available for viewing in the 'Elphen Chronicles by Paul Taggart' Gallery. Click on the image to reveal full details.